This creamy pasta dish is satisfyingly simple to make… and eat. It’s a great midweek supper for two, or you can double the quantities to serve four. 1. Cook the tagliatelle in a large pan of boiling water for 6 minutes. 2. Meanwhile, cook the bacon in a small, non-stick frying pan for 5 minutes until crisp and golden. 3. Add the greens and peas to the pasta pan and cook for a further 3 minutes until the vegetables and pasta are tender. Reserve a ladleful of the cooking water, then drain the pasta and vegetables and return to the pan. 4. Stir in the crispy bacon, soft cheese and salad onions, stirring until the cheese melts, and adding a splash of the reserved water to loosen the mixture if necessary. Divide between two bowls and serve with a sprinkling of Parmigiano Reggiano. 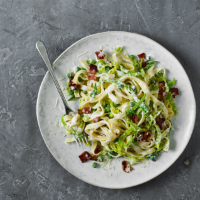 Save time on preparation by swapping the bacon for Cooks’ Ingredients Diced Pancetta. This recipe was first published in Thu Jan 26 12:26:12 GMT 2017.